Lead a Mighty Empire to War and Glory! Are you getting tired of the glut of shooting games that overcrowd the market? Would you prefer to get out of the shoes of the common soldier, and take on the role of the commander instead, overseeing the battlefield and the empire in times of war and peace respectively? If so, then look no further than Game of War: Fire Age. As the leader of a civilization taking its first steps into a hostile world filled with monsters and magic, it will be up to you to turn it into the mightiest empire ever known. It won't be easy; you'll need to become a master strategist, battle tactician, diplomat, and city planner all at the same time. More than that, you'll have to be ever vigilant. 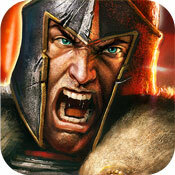 Danger lurks just over the horizon, and barbarians are ready to take what is rightfully yours. Some of them may even be your fellow players. Outwit, outfight and out-build every single one of them, and your name will ring across the ages forever. A strong empire must be built upon a strong foundation. Keep that in mind as you design your capital city, which will serve as the cornerstone for what will hopefully be the dominant culture of the Fire Age. • Harvest and produce five resources: gold, food, wood, stone and ore.
• Construct dozens of buildings, including academies, prisons, hospitals, marketplaces and more. • Maintain the safety of your city and people. Erect walls, set traps, put up watchtowers, train soldiers, and so on. • Research new ways to improve your empire's technology, economics, soldiering and constructive efforts. • Complete quests to earn even more valuable prizes. You don't play an app called Game of War expecting everything to be all roses and sunshine. You're here to engage in bloody war games. Field a mighty army to conquer fertile territory, seize additional resources your people are in dire need of, and defend your borders from enemy forces looking to do the same to you. • Train a variety of brave soldiers, including swordsmen, slingers, outriders, hoplites and archers. • Build frightening siege engines of destruction like ballistae and battering rams. • Train and outfit a mighty Hero who will lead your forces into battle through sheer force of will. • Slay a variety of fearsome monsters that threaten your people, including Minotaurs, Hydras, Stone Golems and Rabid Rabbits. • Forge alliances with your friends to earn more items and resources. • Attack the territory of other players. Take it for yourself, pillage their treasures, slay their heroes, and prove your superiority in the field of battle! With the Game of War app, you have the rare opportunity to create and customize a Greco-Roman civilization set in a mythic world. Will you lead your people to glory, or get stomped into ash? Download it now and find out. What is the Game of War? 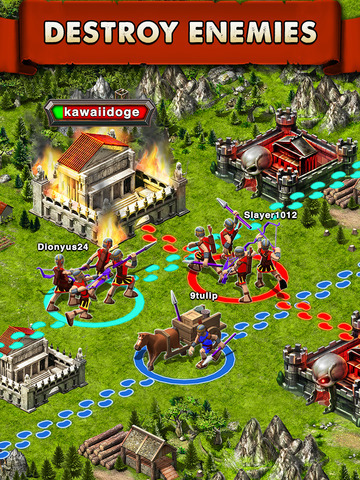 Game of War: Fire Age is perhaps best known for its aggressive marketing campaign. The ads and commercials promise players an adventurous experience in a riveting fantasy world where Kate Upton is the goddess Athena. What they don't tell you is what kind of game it actually is. Is it an epic RPG? Is it part of a long series of free shooting games? It turns out it's a massive multiplayer online strategy game in a similar vein to Clash of Clans. It may not sound unique, as those games are a dime a dozen these days, but is it still a worthy title based on its personal merits? While Game of War stands out among the rest in terms of how it presents itself, that's the most it really accomplishes. At the end of the day, it's just another city-builder with a lot of progress, no real payoff, and a naked desire to nickel and dime you every step of the way. The first thing you'll notice about Game of War: Fire Age is that it looks good. The grid on which you build your city upon is not just the usual flat expanse of grass that these games typically rely on, but a more interesting set of pre-built roads and staircases weaving around scenic statues and reflecting pools. The usual open grassy fields are still there, but in this case, they represent the outskirts where you'll ideally place your farms. It all adds to the feeling that you're in a real city that's been carefully planned out. Speaking of which, the actual buildings you put up look good as well; they're by no means flashy, but they all have a distinct appearance that will allow you to see what functions they serve at a glance. More impressive are the little people you'll see milling around, which makes things look especially lively. Overall, the visuals boast a great level of detail seldom seen in any kind of mobile game. Another area where Game of War does pretty well in is how it connects players to one another. It covers the expected stuff where people can choose to join one another in an Alliance, which can net everyone involved extra goodies, or they can make trouble for themselves by attacking each other's cities. However, the most impressive bit is that Game of War lets players chat from all over the world regardless of language. The game boasts an impressive translator that gets better over time as players help the software understand words it doesn't quite get. If you've played any of the countless mobile city-building strategy war games out there, then Game of War: Fire Age will be immediately familiar. Building by building, you construct your city on a grid. Each building serves a distinct purpose. Some are meant to generate resources for you, like food-producing farms and stone-producing quarries. Others improve your civilization in other ways. For instance, Barracks bolster your armed forces with additional soldiers, Academies allow you to research new ways to improve your empire, and Hospitals can heal soldiers that were lost in battle. Constructing a building is a process of simply choosing where to put it, expending the resources, and then simply waiting long enough for it to finish. It's very formulaic overall, which is where the app's problems begin. Not only is it tiresome to play something so unoriginal, but there's just never been anything remotely fun or strategic about sitting on your thumb and waiting for things to get done. That's how things work in Game of War and the countless other titles that inspired it. You can speed things along with a few rare items, or by simply buckling down and spending real money, but in the end, it just puts you back in the cycle of following the carrot on the stick. After you finish building your latest project, you're either going to go back to waiting to finish the one after that, or you're going to wait so you can generate the resources needed to build that next thing. You're either waiting or you're waiting to wait. Admittedly, it does hook you in. While there may not be much gameplay to find in Game of War, you might still feel a sense of accomplishment in watching your city grow and improve over time. For some, that will be reason enough to keep checking in for progress updates. It's just a question of how long that will last before your patience runs out for the later upgrades, especially those that take days to build. The good news is that city-building isn't the only thing you'll be doing. When your game is called Game of War, it's only inevitable that battle will eventually be joined. On the surface, it seems like there's a fairly in-depth war game aspect to the app. There are multiple military units to train, like archers, swordsmen, spearmen and so on, and they in turn can operate siege engines like the onager, battering ram and ballista. Everything has a purpose, with all units having something they're strong and weak against. Additionally, your empire starts with a powerful Hero unit who gains levels over time and whom can be equipped with powerful gear nobody else can use. Game of War appears to set the stage for what appears to be a fun tactical element. The bad news is that it's all a smokescreen. Unlike Clash of Clans, there is no war game to be found. You have no say in how the battle unfolds. When you launch an attack on a monster roaming around the wilderness or a player-controlled city, all you do is just wait some more. You wait for your army to reach its destination, you wait for the computer to decide who the victor is by matching your statistics against the enemy's, and you wait for them to come home with whatever spoils they captured. That's all there is to it. However, that's not to say that warfare is an entirely one-dimensional affair. At the very least, it keeps you on your toes. Just as you can attack neighboring cities at any time, so can your opponents. Therefore, it's important that you maintain your army and defenses, keep up a steady offence to prevent them from bolstering their militaries too much, and repair whatever damages your keep unexpectedly incurs. Unfortunately, this is where the usual free-to-play issues rear their ugly heads. Even if you have the patience of a saint to wait for vital upgrades to come, your opponents may not. If they're able and willing to pay real cash to make their empires better than yours, there's really not much you can do except take your inevitable losses or buckle down and start paying as well. Money is ultimately the deciding factor to success in Game of War. Game of War: Fire Age looks nice and has some well-designed social tools. Unfortunately, that does little to distract one from the fact that it's an otherwise banal and unrewarding strategy title that requires you to keep paying in order to get anywhere.